On Tuesday I went to Lincoln Center to check out the scene outside New York Fashion Week. 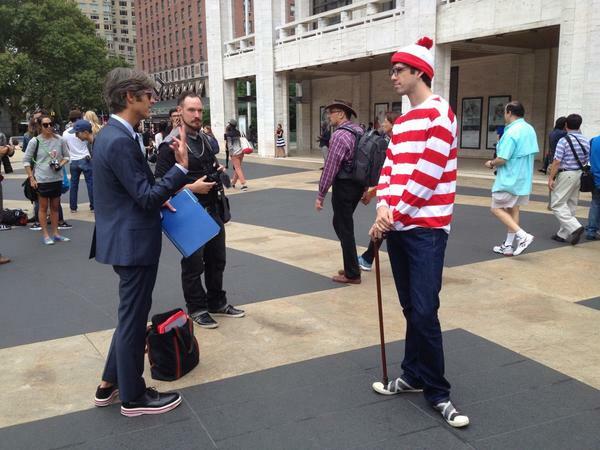 I wanted to be inconspicuous and just observe, so I dressed up as Waldo, a character known for his hiding ability. People were really, really excited to find me. Some people spied me from far away. Others got up close and personal. My outfit cost about $30 bucks from an online Halloween costume store. I was surrounded by people wearing clothes that cost hundreds and hundreds of dollars. So naturally people wanted pictures with me. I was interviewed a couple times. "What are your fashion inspirations?" "Uh, candy canes and barbershop poles, mostly." But mostly I just walked around. Looking for my buddy The Wizard Whitebeard. And trying to avoid that dickwad Odlaw. I opened up Google Maps to try to figure out where I was. I heard "I found you!" a lot. 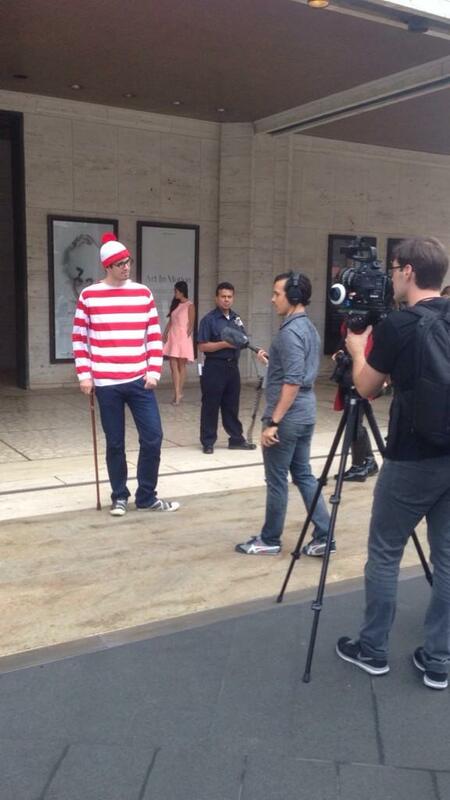 I guess Waldo was getting rusty. I probably ruined what were otherwise good shots just by virtue of being in the background. But other times I accidentally contributed to some pretty artsy photos. Later, I found out that my horizontal stripes were apparently a big hit on the runway, too. It makes sense. Red and white stripes make a bold statement. Also I think canes are making a comeback. And round glasses will be the new hipster glasses. I'M CALLING IT YOU HEARD IT HERE FIRST! After a couple hours it was time to leave. Eagle-eyed New Yorkers even spotted me on my way back to the BuzzFeed office. People may have found me, but in the end, I like to think I found... myself. You can see more Fashion Waldo here.